5 Martin Place provided a challenging and rewarding project for ASP Access Floors with its large central atrium and its fusion between the existing heritage building and the new built tower wing. 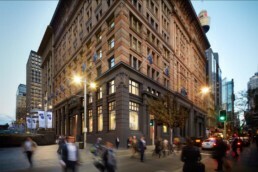 5 Martin Place offers 19 levels of premium office space. The building comprises a redeveloped heritage building and a new tower extension with a large 11 storey central atrium, triple height foyer and large floor plates. ASP installed access flooring in both the heritage building as well as the new tower. In the heritage building consideration in the installation procedures had to be taken to ensure the existing heritage floors were unmarked. ASP engineered a solution to the large expansion joint between the heritage building and new tower, so that the access floor was able to run seamlessly through this transition point.